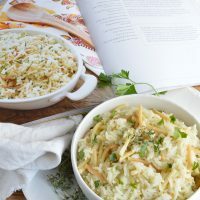 This Easy Rice Pilaf Recipe from The Weeknight Dinner Cookbook is just one of many amazing dinner recipes. Rice pilaf made in about 20 minutes is perfect for weeknight cooking! 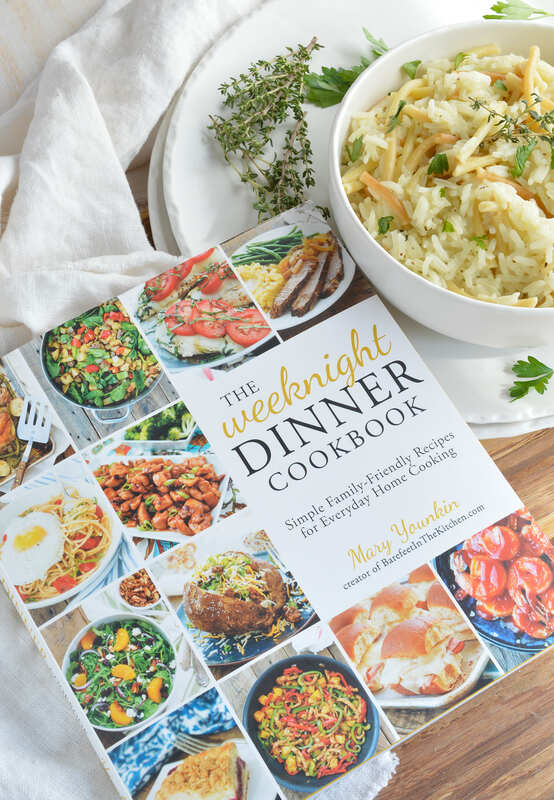 I received a copy of The Weeknight Dinner Cookbook to facilitate this review. 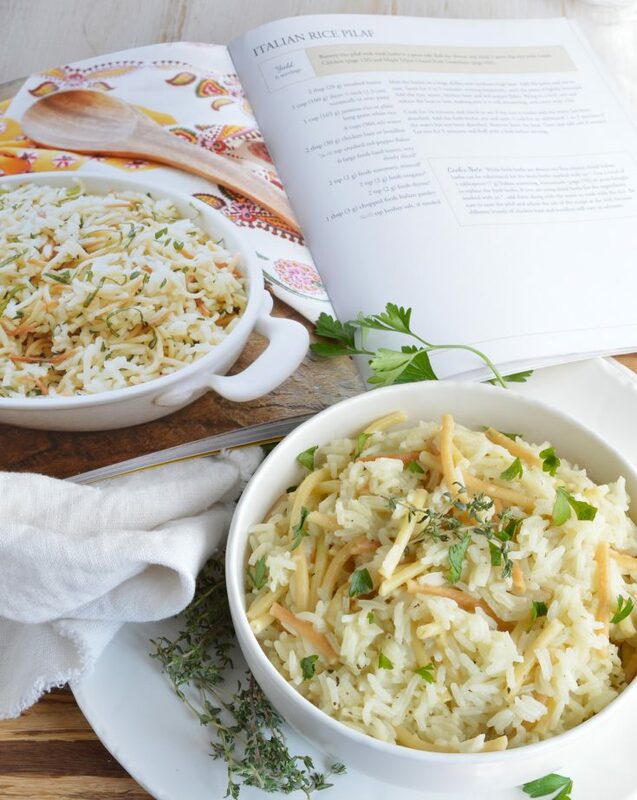 This Rice Pilaf Recipe from The Weeknight Dinner Cookbook is the ultimate! Seriously, I have a major rice pilaf obsession since making this. Not only me but my daughter too. And she does not even like rice! That is what The Weeknight Dinner Cookbook is full of. . . simple, delicious recipes that the family will love! Mary, the author, is a fellow blogger. She shares her tasty dishes at BareFeetInTheKitchen.com. I have also had the pleasure of meeting her in person and she is an absolute doll. One of the sweetest most genuine people you will come across. This cookbook is great because the recipes are easy to follow and each has a photo. We need to see what the end result is supposed to look like, right? This is the type of cookbook that will be used time and time again. 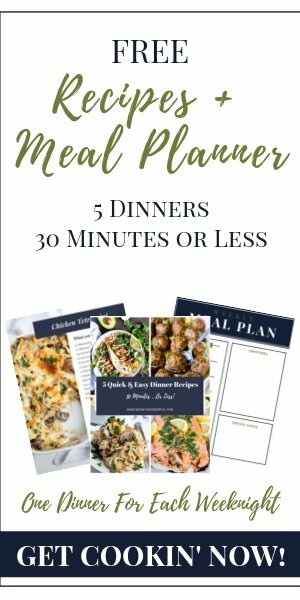 Some of the other tasty recipes are: Roasted Bruschetta Potatoes, Spicy Chili Garlic Beef and Broccoli Soup, Chicken Cordon Bleu Sliders, Cinnamon Toast Cake and Lemon Lover’s Pound Cake. So many delicious choices . . . where do I begin!?!? 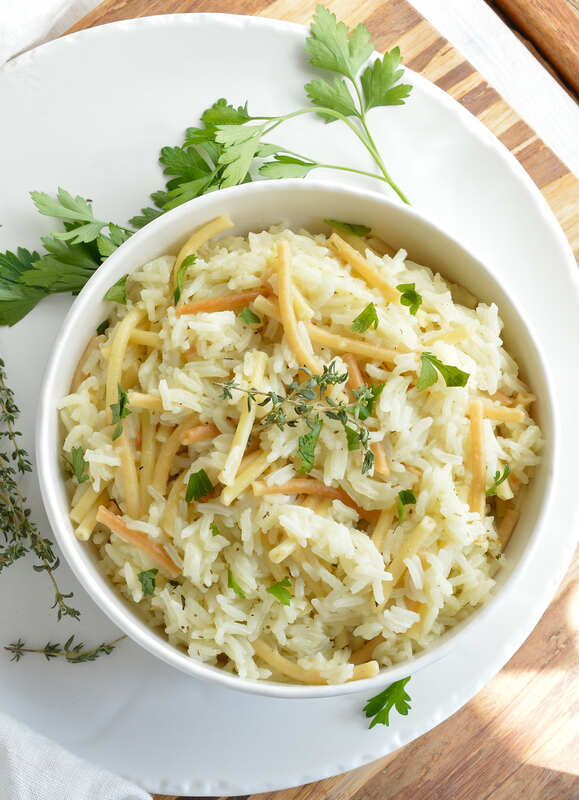 This Easy Rice Pilaf Recipe is fantastic as a side dish or meal. I have been adding chicken and veggies to make it an entree. This dish is so versatile, add whatever you like. The recipe calls for vermicelli pasta but I used what I had on hand which was bucatini. Melt butter in large pan over medium/high heat. Stir in pasta and cook for 3 minutes while stirring or until pasta is golden brown. Add rice, water, chicken base, red pepper flakes and Italian season. Bring to a boil, reduce heat to low and cover. Simmer for 15 minutes. Test rice for doneness. If rice is not yet tender, continue cooking and add water as needed. Stir in fresh parsley and thyme. Salt and pepper to taste. Cook 1-2 more minutes or until liquid is absorbed. *I really love the Better Than Bouillon brand. This recipe makes enough for a family of 4-6. I now cut this recipe in half to serve 2-3. The only difference is 1-2 minutes less needed for cook time. I’m so happy that you’re loving the rice pilaf! 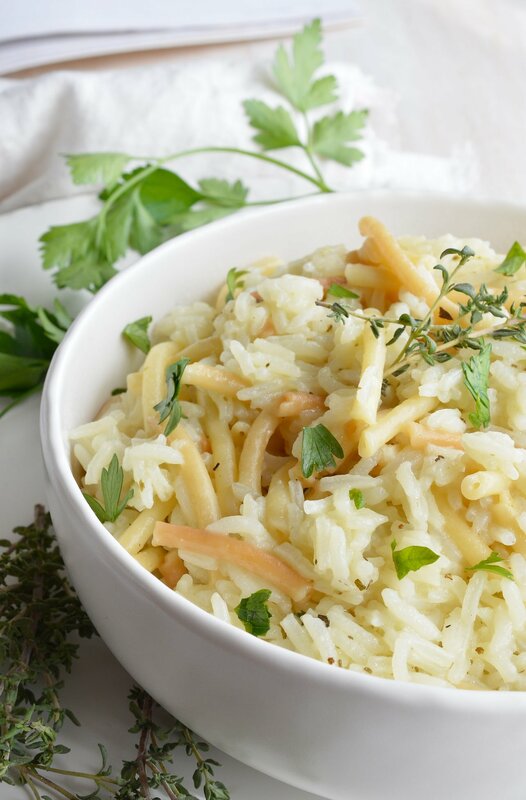 We all adore it and it’s such a simple way to dress up rice as a side dish. (I love adding a protein and vegetables to it too!) Thanks so much for your sweet words about the cookbook. I’m glad you are enjoying it!